A genus of world-wide distribution, four species have been collected in Michigan. Closely resembling nymphs of Enallagma and Coenagrion, mature specimens of Ischnura can be distinguished from the former two genera by the distinctive banded pattern of the eyes (which may be faint or lost in preserved specimens), and the pattern of abdominal spines along the lateral carinae of the abdominal segments. Many texts have utilized the character of seven distinct antennal segments to differentiate Ischnura and Coenagrion from Enallagma, however this is not reliable. I have seen specimens of Ischnura, particular immatures, with only 6 complete antennal segments, and the last antennal segment of some mature Enallagma individuals may bare a faint annulus that may make the segment appear as two. Nymphs are principally lentic, most frequently found in wetlands, lakes and ponds with plentify aquatic vegetation. Specimens are also encountered in slow-moving or backwater areas of streams and rivers that likewise have abundant aquatic vegetation. I. posita (Hagen 1861) tends to favor spring-fed brooks with slight current and ponds (Walker 1953). I. kellicotti (Williamson 1898), known only from a couple of southern Michigan counties, appears to be associated with lillypad ponds (Nuphar and Nymphaea), where nymphs cling to the undersides of these floating plants (Westfall and May 2006). I. hastata (Say, 1839) has recently been recorded in the Lower Peninsula (Craves and O'Brien 2002). I. verticalis (Say, 1839), by far the most common of the species of Ischnura in Michigan, is almost ubiquitous in any permanent or temporary lentic environment. One of the earliest odonates to emerge (perhaps our earliest damselfly in flight), adults of I. verticalis begin to appear in early May. Ponds on the UM-Dearborn campus had (1996) nearly mature nymphs as of April 15 (EB, pers.obs.). Populations can be multivoltine, and adults are seen on flight as late as late September. Only sphagnum bogs and muskegs tend not to support large numbers (Walker 1953). 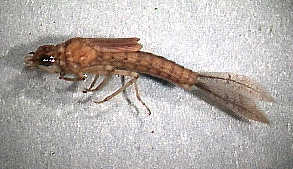 I (EB) have collected nymphs in conditions that appear quite eutrophic and exclusive of most other odonates. One record of I. perparva McLachlan, a western species, was incorrectly identified and has been removed from our state list (O'Brien 1997). Craves JA., O’Brien DS. 2002. Ischnura hastata (Odonata: Coenagrionidae): New for Michigan. The Great Lakes Entomologist 35:21-23. Hagen HA. 1861. Synopsis of the neuroptera of North America, with a list of the South American species. Smithsonia Miscellaneous Collections 4:1-347. O'Brien MF. 1997. Ischnura correcta. Williamsonia 1(4): 2. Say T. 1839. Descriptions of new North American neuropterous insects and observations on some already described by (the late) Th. Say.Journal of the Academy of Natural Science of Philadelphia 8:9-46. Williamson, E. B. 1898. A new species of Ischnura (Order Odonata).Entomological News 9(9):209-211, pl. 9.